The land of Literature is a fairyland to those who view it from a distance, but like all other landscapes the charm fades on nearer approach, and the thorns and briars become visible. It seems I have difficulty with the truth. It became evident when I set out to write a memoir about my Indian adventures, to leave for my grandchildren. Very soon I came hard up against the limitations of truth; real life just doesn’t fit into satisfying, creative shapes, even when you leave out the boring bits. Within six months, I was tentatively exploring fiction. That was nearly three years ago. One miserable and depressingly cold day, I sat down to write in an attempt to cut myself adrift from the truth that was keeping me safely moored in the doldrums. It was so cold I grabbed the dog’s blanket, threw it over my knees and began to write. And then it happened, like Cixous, I went off writing, the blanket tucked around my knees, was like being in a sleigh, no ordinary sleigh, but one that H. G. Wells might have used for his time machine. The sense of unlimited freedom and infinite possibility, gave me a head rush. Of course, these feelings did not last, but I never forgot that first, safe, physical cocooning that precipitated the mental abandonment necessary for creating fiction. After a while, I began to seriously miss making art, and drawing, which I always somehow maintain, was not enough. I decided to make a blanket in the evenings as a counterpoint to the daily mental effort. And mindless crochet was perfect, muscle memory meant not having to look or even think much about what I was doing. But the decisions about colour and texture were another matter altogether. My source materials were a disparate collection of leftover wool from various projects, plus, ancient family inheritances with their accompanying emotional attachments. I chose and applied colour harmonies, with runs and reversals, according to my mood. In the beginning, the words flowed easily and I thought they were great. After initial success, I was felled by pride: What am I doing? It’s all rubbish and any way I could never be as good as, (Katherine Mansfield, Virginia Woolf, Iris Murdoch, et al.). And then it got much, much harder, bleak, anxious days where words were policed with self-doubt. But gradually I applied myself to writing craft through the explorations of generous authors. And always a voracious, if eclectic reader, I reread all my favourite books, through a deconstructing lens. In the evenings, the blanket grew, but I still had no idea of its final shape or function. 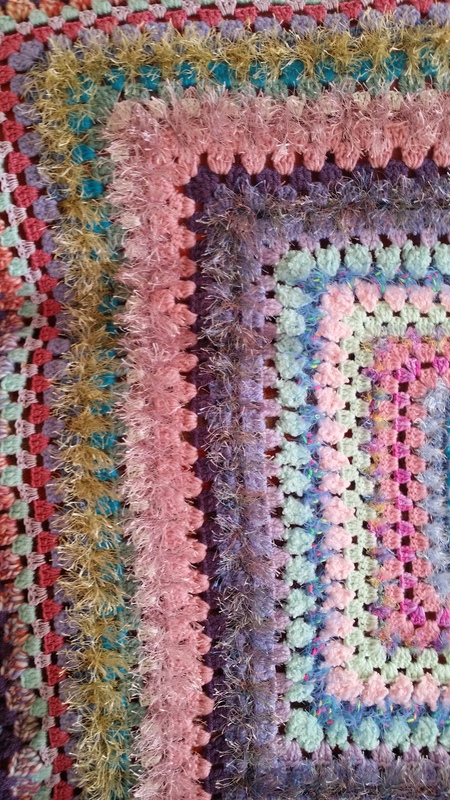 Eventually I decided that the blanket must be for my mother, who at ninety-six still finds it difficult to relax during the day, so I thought this might help. Deciding on its function, determined the ultimate size and shape of the final blanket. And suddenly it was finished, a whole, a thing in itself with its own identity. I had never taken two and a half years to do anything, much less commit myself before starting. Up until that point, I had never really believed that I might actually finish the book, now I could see that it was possible. The blanket ran parallel to the book and mirrored its process, it insulated, and protected tender budding ideas, it was my cloak, my mantle, my security blanket. The finishing of the blanket was a timely fruiting, a natural end, and now that it’s gone (not literally, it’s in St Albans with my mother) it’s time to finish the book.